Sunday football is back and we’re so excited because that means good times and amazing food with friends and family. We love to have the whole crew over to cook up some CookingShorts favorites. This recipe is a favorite among our crew and is soon to become a favorite to yours. Now just one question for you … Are you ready for some FOOTBALL? Preheat oven to 350. In a small pot over high heat combine the plum sauce, orange juice, ginger root, soy sauce and red pepper flakes. Bring up to a simmer and lower the heat. Heat olive oil in a skillet over medium high heat. Liberally season the chicken wings with salt and pepper. Once the skillet is hot add the wings (6 at a time, in two batches). Brown the wings for 3 minutes per side. Add first batch of wings back to the skillet. Remove ginger from glaze and pour plum glaze mixture over the browned wings. Place the skillet in the oven and roast for 20 minutes. Flip the wings once half-way through the cooking time. Remove the wings from the oven. 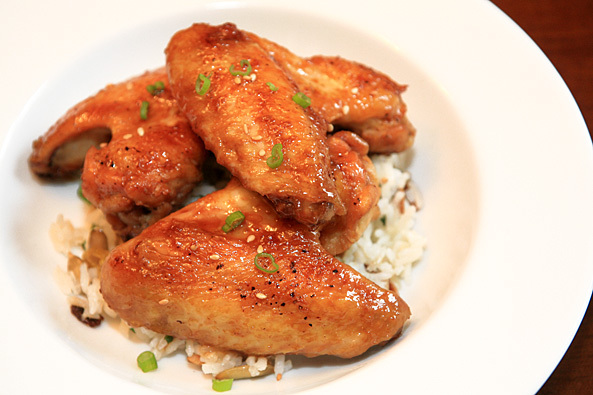 If some of the wings aren’t completely coated in the glaze, toss the wings around in the glaze that is left in the skillet. Finish with a garnish of the fresh cilantro.